This single line phone features a 2 line, 24 character display with 2 programmable feature keys, a message waiting indicator and 9 fixed feature keys. 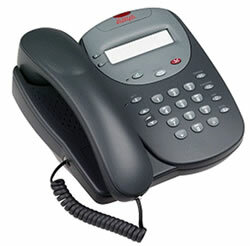 It connects via the LAN to the Avaya IP Office server. 2 x 24 Character based Eurofont display with 2 programmable feature keys. Call Monitor Speaker (not a speaker phone). The 4602SW includes all of the above features plus an integrated Ethernet switch for PC connection. Second full Duplex 10/100 BaseT Ethernet port for PC pass through connection.